An infuriated President Rajapaksa on Friday accepted the resignation of Chris Nonis as Sri Lanka’s High Commissioner in the United Kingdom. His acceptance came from Rome where he had visited the Vatican on a special flight to meet Pope Francis. Rajapaksa was furious that Nonis, a dyed in the wool Catholic, had persuaded Cardinal Malcolm Ranjith (who also went to Rome) not to allow Sajin Vass Gunawardena, Monitoring MP for the Ministry of External Affairs, to meet the pope. This is when Rajapaksa, Chief Justice Mohan Pieris, External Affairs Minister G.L. Peiris and a host of others had an audience with the Pope. Vass Gunawardena, though he was part of President Rajapaksa’s delegation, was thus prevented from meeting the Pope. 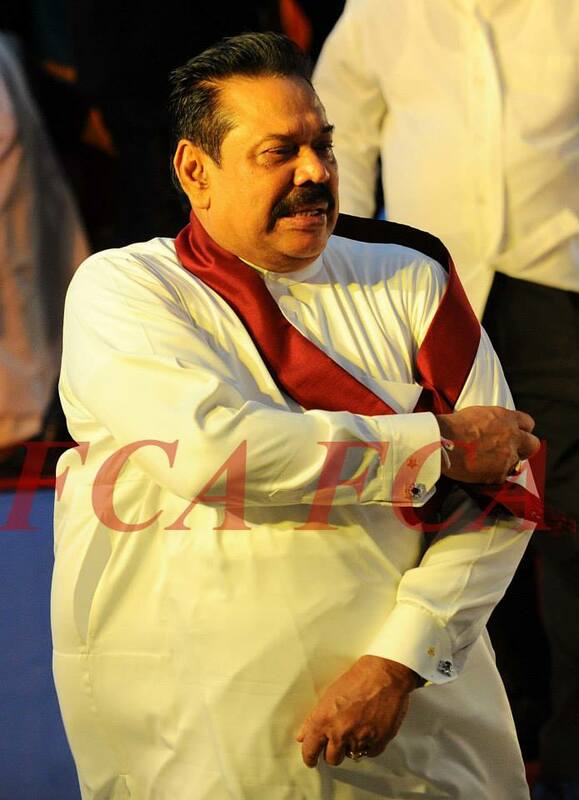 This angered Rajapaksa and he ordered G.L. Peiris on Friday (the day he called on Pope) to accept Nonis’ resignation. The news came just a day after the Information Department in Colombo announced that there will be an inquiry into the incident where Nonis was slapped and into a complaint by External Affairs Ministry Secretary Kshenuka Senewiratne that Nonis abused her. Before that President Rajapaksa ordered all the Colombo media to blackout the incident to save Vass Gunawardena. Even official spokesman and media minister Keheliya Rambukwella who first admitted the incident at a news conference later spoke to G.L. Peiris on his mobile phone. After Peiris denied there was any such incident, like a parrot Rambukwella repeated the same remarks. As a result, there is more mud on the face of the government. One UPFA Minister said Sajin Vass Gunawardena will be allowed to continue. “Don’t be surprised if he is made Deputy Minister of External Affairs. Bad eggs get promoted whilst others are used like condoms and dropped,” he said. It was Colombo Telegraph that initially disclosed the attack on Nonis by the Monitoring MP for External Affairs Sajin Vass in the presence of External Affairs Ministry Secretary Kshenuka Senewiratne in New York. However, despite the President’s attempts the story was eventually published in several local media including newspapers and websites but they have all withheld from naming the attacked as Sajin Vass. It’s alright and Lankans have the ‘political’ right to make ‘hay'(loot money) while the sun(MARA) shines. When the head of state and his cronies are doing big time day light robbery and looting, why not poor others also do the same in a small way or look after their own business ventures, earn commissions and do other private activities like Jaliya or ‘Thosthara’ Nonis Appu ? ! It’s all in the game and no blame. We are getting somewhere for sure but no one knows exactly where all these will lead Lanka to ?! [Edited out] orders luxury Airbus units for their travels while the poor of the poor of the country sink with their day today survivivals. What a leader ? People of this island nation is double punished. Stupidity and naivity of poor majority have been betrayed by Rajapakshes to this day. Ranil did not comment about attack on Nonis!!! That is because Nonis is [Edited out]! I have read numerous comments and mud slinging directed at Dr Nonis! Well from all that,one could come to the conclution that the career deplomats are up in arms against this appoinment…well poor you for being overlooked, do not cry here cry on someone elses showlder. Dr Nonis is a gentelman and comes from aristrocratic stock. He made us proud bu getting CHOGAM to Sri lanka. Without him this would not be possible. His concluding remarks at the National defence seminar and the manner in which he handled the foreign media was simply outstanding! He has interacted with royalty and was instrumental in getting Prince charles to attend CHOGAM. There aren’t many like him in this country. I wish there were more gentelman like Dr Nonis and less thugs in this land. Then our country would sure be a paradise! It’s sad to see a medical doctor once commited to social service, man handled like this..he was one who volunteered to help our country. How can such a person be treated like this? Well for thouse of you who critisize and want sling mud, let me tell you this. When you point one finger at Dr Nonis there are 4 pointed at you. Obviousley you are not the same class as he is..oooozing with jelousey. Under no circumstances should one be happy at another’s misfortune. Such people are wicked and ungodly. Dr Nonis is different, he is a gentelmen. The Catholic church prays for his safety..
Well said and many of the intelligent CT readers agree with you. Yes we have seen many mere bag handlers of Govt politicians given Diplomatic posts in various countries who do not have the basic knowledge of International relations, basic Diplomatic skills or even basic Communication skills. Today, Sri Lanka’s former permanent representative to the UN in Geneva, Tamara Kunanayakam said the assault of High Commissioner Chris Nonis is only one in a series of acts in a tragedy that opened in Geneva in 2009 with the same cast of villains, followed by other acts also in Geneva in 2011 and 2012, and still others played out in Rome and Paris.ations, diplomacy or basic communication skills. Also UNP Karu Jayasuriya say……” Out of 49 diplomatic positions created by this regime no less than 35 have been filled up by stooges of the regime who have chosen to treat Foreign Service like a tool for own social and financial advancement. The only credential that is required is blind loyalty to those who govern”. He also says….”’The Diplomat’ magazine once named Chris Nonis as the ‘diplomat of the year’. He was capable of achieving that singular honor from amongst 164 diplomats in Great Britain. It is indeed a rare honour for a Sri Lankan. It is such a person that has fallen prey to his own indecent political masters. We also need to analyze who this Sajin Vass Gunawardana is. What I herd was he was an ex Trico Warf Clerk and who was a convicted felon spent Jail term who met Pres.Rajapakse in UAE where the relationship began. Also we herd previously he approached Ranil for a political appointment, but Ranil refused. We also need to know who Kshenuka Seneviratne is. We know that she was once a dancing partner of Namal baby, the synthetic Lawyer. She may have taught him few dancing steps….and ….. So she has all the blessings, cheer and protection from the Big Papa. Finally we know what happened in NY was not an isolated case. According to Ms.Tamara Kunanayakam our Foreign Ministry is infested with snakes, thugs, crooks, ex. convicts, leeches and robbers who run it like a Thug Mafia den. She says…..“The method they used then to disarm Sri Lanka’s representatives was mobbing. And now they have advanced to physical thuggery, and these top “diplomats” continue their devastation, not only with total impunity, but enjoying high patronage, promotions, and financial advantages. We also know that behind every man’s fall, there’s a vicious “snake woman”…. and not a Good woman. Therefore no wonder under President Rajapakse, Sri Lanka has become the Wonder of the uneducated, uncivilized monkeys, looters, mobsters and thugs world. If he was a gentleman he would not have agreed to represent the country run by war criminals and kleptocracy in the first place. What do you really mean by aristocratic stock? Is he blessed with two of every vital organs? The entire event was an insult to the people of this island. Cameron started his 2015 election campaign from Jaffna and told MR off. Did Dr No purposely did this to MR and the country? I wish there were more wise gentleman and less Dr Nos in this land. It was a paradise, which in now lost forever, because of people like Dr Nos. What would you say to the person who has only 1 finger? Oh yes you still living in the past with caste & class prejudices. Of course one shouldn’t however he brought this on to himself, a fine mess. Is he planning to work for an NGO? If he was he would have championed the causes of poor, vulnerable, victims, religious thuggery, racism, ……………. above all he would have spoken about war crimes and crime against humanity. Dr No should not waste time publishing statements from Character Witnesses on the contrary he should brave the press and let them know as to what exactly happened to him on the particular night in question and since. Fernando what BS have you been bubbling ? Who on the earth believe that Nonis made us proud getting CHOGM to sl. All the western countries know perfectly well that Rajapakshe Regime is the most brutal one the Island ever has since independence. They not only eleminated brutal Ltters but also thousands of own citizen (tamil civilians)- now turning to eleminate muslims and the rest of sinahelse that would go against their radical crime friendly agendas. No any brutal leaders can stay in power for that long. So the days of Rajapakshes are almost gone. Nonis could have thought better before joined to them. If he is a genetleman he could well reveal a lot about the harm targetly made by Rajapakshes killing those cilivians in the last end of the war. Today, we the sinahalya and other srilankens have to face all kind of curse while travelling through globe only because MR and his regime has not proved their affinity towards the improvement of HR. Even today, the man I heard plouding about his untangible progress made to the nation and country. Dr nonis must educated and diplomat. But I dont why he ecnouraged the ruling thieves and gangstas all this time. How come an educated man be with stupid egotastic ignorant robbing everything destroying baboon like the ruling clan and the family? I raise my hat off to you Jayanth one amongst a few good men! As a Citizen of this country I am only trying to stand up for what is right. Like you mentioned he earned the title diplomat of the year amongst 164 diplomats in the UK. Obviously our sour “Native Vedda” which he surely is would not stand a chance in a forum like this. His simpleminded attacks will go well here, that’s fine. Well’ the bottom line is when things like this happen, the “diaspora’ will have a field day! I have a feeling that the Native vadda is paid by thugs to attack this man..well if that’s the case same on you Sir. That’s all I have to say about the subject. Leave Dr Nonis alone and let him live in peace.. Sorry I am not fluent in doublespeak therefore I am not qualified. Please let me know the name and contact details of the person who is acting on my behalf without my knowledge. The so called thugs haven’t paid me for my work as you believe, is he a free rider/loader? Instead of depending on few well wishers to communicate with media please advise your shameless gentleman to meet the press and make a full statement on this unique experience of “our man in London”. Good Job, the Cardinals blocked that Ogre, SVG, trying to wash clean his sins by posing with the HOLY FATHER. The only place fit for him is with the marayas in HELL. Basket! I think we all have mislead by this incident of alleged attack on Dr Nonis. Because Finally the pro LTTE diaspora had won the day by acheiving two obejectives. Firstly getting a patriotic true son of Sri lanka out of their way and secondly by creating a row/misunderstanding between him and the president, president will lose an ally at the time he need Dr Nonis mostly ( Opposition is now fishing in the trouble waters).Al this were acheived by the LTTE with the support of this wicked lady. when she was at Geneva and London her husband was very close with the LTTE elements and was funded by them. In London he was doing Car business with that money.The same party got this lady to work according to their agenda by paying her handsomely and she in return paid and influenced the monitoring MP by using her usual charm to get rid of 5 other diplomats before Dr Nonis. Nonis was the last in this list which includes president’s Cousin Jaliya. This Stupid Thug MP ( maybe for the money he received from LTTE)carried out this vicious unpatriotic woman’s agenda and still carrying on. Over to you Defence Secretary to mobilise your inteligence units to probe in to this woman’s and her husbands activities. How on earth she got the money to buy a house in London. It is worthwhile investigating. I don’t know Dr. Nonis personally, but I have seen him in interviews giving as good as he gets, defending his corrupt masters loyally instead of selling us out to the foreigners for personal praise. Sadly, some of us do E.g. former General Sarath Fonseka.